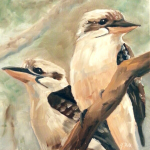 “The Lads” (Kookaburras) Oil on panel 6×6″ Daily Painting for Jan 9, 2015. These guys sit in the tall gum tree above my vegie patch. I caught them on camera at 5am one morning.